Note: WooCommerce Helper is part of WooCommerce as of version 3.1. Purchase, connect, download products and activate keys in one place with ease. Read more at Managing WooCommerce.com subscriptions. This page refers to the former WooCommerce Helper, available as a separate plugin up to WooCommerce 3.0x. Documentation is no longer being updated. We recommend updating to WooCommerce 3.1x to simplify and enhance your install. 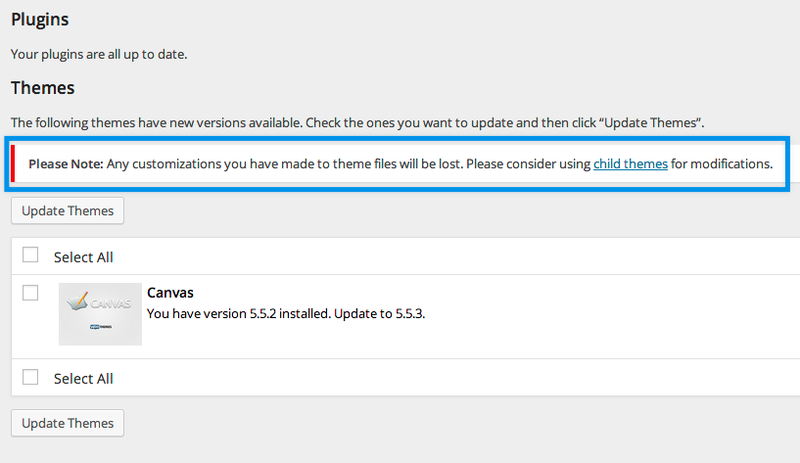 Easy Updates via the WordPress Updates page. We only provide support for sites with an activated subscription key for that product. Download the WooCommerce Helper plugin (woothemes-updater.zip file). Select Upload Plugin at the top. Choose File and select the woothemes-updater .zip file. 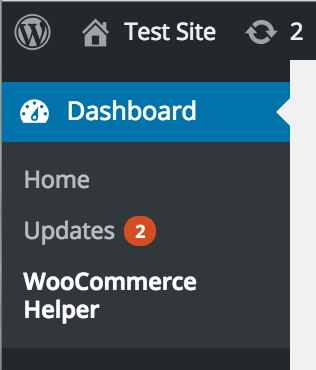 On your site or store, go to: Dashboard > WooCommerce Helper. Under the Subscriptions tab you can connect your WooCommerce.com account to activate subscription keys or manually copy and paste subscription keys for all of your WooCommerce.com purchases. Note: The Help tab has other useful resources. Click the big blue Connect your WooCommerce.com Account button. Log into the appropriate WooCommerce.com account if needed. All subscription keys for products on that site are connected and activated for you. You can manually add subscription keys if you don’t want to connect your WooCommerce.com account to the WooCommerce Helper on a particular site. Go to: My Subscriptions on your WooCommerce.com account. Go to your site > WooCommerce Helper > Subscriptions tab and paste the subscription key into the field for your product. Select the Connect Subscriptions button to activate the key. Plugins, extensions or themes that are missing from the list of Subscriptions are those that need to be manually updated. It means that the version you have is older and cannot be detected by WooCommerce Helper. All settings are saved on your site, so you can download the latest version from your WooCommerce.com Account Downloads page and manually update the product. 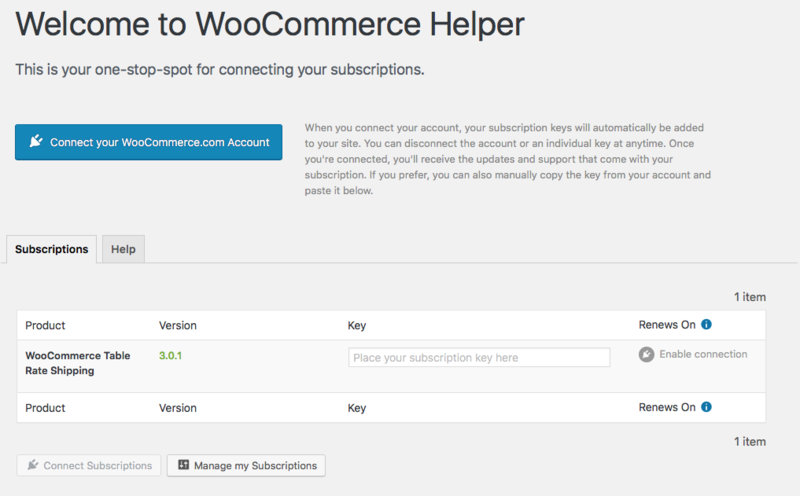 It then displays in the WooCommerce Helper, and you can activate your subscription key(s). Note: Custom CSS to a theme are protected if in a child theme; custom code in plugin files will need to be redone. One subscription key entitles you to use on one live site and one testing/staging/development site as of November 2016. There’s no need for you to transfer keys via deactivating on one site and then reactivating on another. If you have more sites than the number you purchased, then you can move the subscription key between sites. Activate the key on the site you need it most, so you’re getting support and updates on that site. The product still functions 100% without an active key; you won’t get easy updates or support for that site without it activated. Move keys from site to site. Deactivate your key and reactivate on the other site. Go to your WooCommerce Account Dashboard > My Subscriptions page. Then reactivate the same key by on the next site by going to your respective site’s Dashboard and following instructions above in Activating Subscription Keys. Step-by-step instructions are found at: Deactivate/Reactivate Your Subscription Key. Once you have activated keys for product(s), WordPress is able to update them from the Updates page. It is important to use a child theme, or hooks and filters if you customize the core code of a product. If you do not use a child theme/hooks and filters and you update a product, you will lose your customizations. Go to: Dashboard > Updates. Check the box for your product under Plugins/Themes. Select the Update Plugins/Themes button. Updating your product through Dashboard > Updates. If you are using a multisite setup, you need one subscription/key for each site where the plugin/extension is installed/activated. The WooCommerce Helper works with a multisite. You’ll need to network-activate the WooCommerce Helper to activate your keys and also network-activate the extensions. *These extensions create database tables and/or new pages and are not set up to do this on a multisite network. Deactivate your key for the URL that is no longer in use. Reactivate on your WordPress site via Dashboard > WooCommerce Helper. When transferring your website — even from a staging server on a platform such as WPEngine — the keys remain “active” on your website’s database, but are not actually active on our servers. Keys are active for specific URLs. Therefore, when moving from a staging server or other URL, the URL changes and makes the key inactive. Your server may be blocking connections to WooCommerce.com via a firewall. The best solution is to check with your web host. Follow the step-by-step instructions: Deactivate/Reactivate your key. This typically fixes the issue. Either you haven’t activated a key, or the server is blocking the connection. If the latter, check with your web host. b) you activated the key, changed the site URL or changed from http to https, and now it is not picking up the updates. This has been resolved in the latest version of the Helper, the key is automatically deactivated if the URL doesn’t match correctly, but your WordPress installation may think the key is still active so deactivate and reactivate it in your WordPress admin. If you receive this error, go to WooCommerce > System Status Report to check if SUHOSIN is activated on your site. If SUHOSIN is activated this means your hosting provider is likely setting a suhosin.post.max_name_length variable in the config which causes inputs with long names, like the license key inputs, to be discarded when you click ‘Activate’ as it is longer then the limit in the config. If activated, contact your hosting provider about removing the suhosin.post.max_name_length limit or increasing it to 200 so key activations can work. Two-click updates of the product. Support for the product through our Help Desk. Note that we only provide support on tickets for websites that have authenticated keys. If you have an older version downloaded before 26th November 2013, you need to manually update your theme, as there is a new theme_info.txt file inside your theme zip file which is needed. If a language file is contained within the plugin itself, and is not a part of the original plugin package (e.g., You added it yourself), this language file will be overwritten in the same way it would be overwritten in a theme. For language files, we recommend creating a wp-content/languages folder, to store your translations when upgrading a theme or plugin. If you can’t see your products, you might need to tell WordPress to force check by clicking the Check Again button at the top of Dashboard > Updates screen. It may take a few times to work. If you have purchased products and are missing keys, submit a ticket at our Help Desk with the order number for products you are missing. Yes. We have an extensive section in our WooCommerce FAQ with the most common questions asked about keys and subscriptions. Already searched this page and still need assistance? Get in touch with a Ninja via the Help Desk. My key says it’s been activated already. Everything looks to be activated, yet no updates are coming through. Why do I need a key? Will my product work without the key activated? Why is my theme not showing up in the WooCommerce Helper? What happens to my translation (.mo/.po/.pot) files on automatic update? Why can’t I see my products in the Dashboard > Updates page? I’m missing keys for plugins/themes on My Subscriptions account page. Where are they? Do you have more info on keys?